Linked into the Kohl mental preservation network, Harry Kim endured searing confrontations of his deepest fears. Place on mission. Now and start of each mission or scouting attempt here, opponent names a skill. All your personnel with that skill are attributes -2 until end of turn. Characteristics: "The Clown" dilemma, place atop mission. 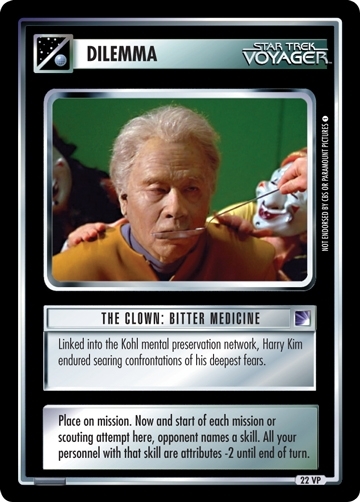 If you play OTF this card replaces the backward compatible 2E card The Clown: Bitter Medicine from Fractured Time - ST1E compatible (the 2E card is no longer valide in OTF). Card logging info: First edited by Telak at Feb 28th, 2015. Please support openCards and validate game text of this card! There are 7 entries for The Clown: Bitter Medicine (ST1E 0 VP 22) at the Tradeplace (3 haves and 5 wants). Click here to see all trade list entries for this Virtual Promo card!